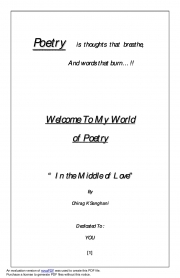 Description of "In the Middle of Love (eBook)"
Kaagaz-e-Zindagi ka Rang Badal diya !" You may say that I'm a dreamer...but I'm not the only one !! Reviews of "In the Middle of Love (eBook)"